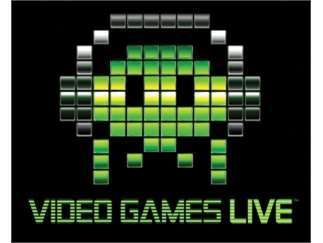 Video Games Live is an immersive concert event featuring music from the most popular video games of all time. Top orchestras and choirs perform along with exclusive video footage and music arrangements, synchronized lighting, solo performers, electronic percussionists, live action and unique interactive segments to create an explosive entertainment experience. This is a concert event put on by the video game industry to help encourage and support the culture and art that video games have become. Hear your favorite video game music played live for the first time ever right in front of your ears by a full orchestra and choir. Video: see exclusive footage of your favorite games synchronized perfectly to the music and lights on giant interactive screens. Theatrical Stage Show: certain performances and segments will include live action, stage performers, special fx and a fully designed synchronized light show. An Interactive Video Game: a handful of lucky audience members will be selected to come up on stage and actually play a video game while the orchestra plays interactively with them for a chance to win valuable prizes.